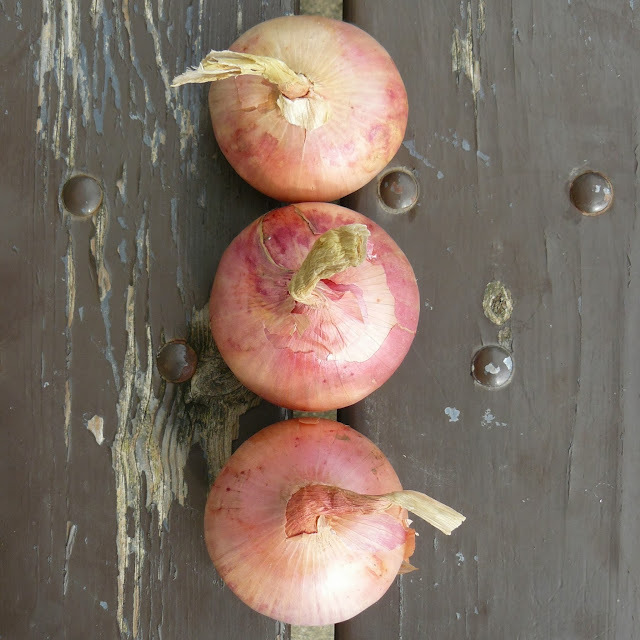 What do wine and onions have in common? Quite a bit actually - they are both produced in France, they both come in red, white and rosé varieties and they both have an Appellation d'Origine Controlée AOC (the certification to ensure a product comes from a specific region). Yes, you can buy a pink onion, the Onion de Roscoff and I am a little bit in love with it as it is a good size, has a lovely pink tinge and tastes fantastic. Here is a little bit of history. Onions have been grown in the north of France in Finistère for over three hundred years it was this onion growing region that gave us the now iconic image of the Frenchman; on his bicycle, wearing a blue stripy top and with his strings of onions. In 1828 a young onion grower from Roscoff decided to travel to Great Britain to sell his onions and each year more and more producers followed him. Some on foot, some on bicycles, all with their plaited onion strings as this made them easier to store and to transport. These sellers became known by the British housewives as Johnny Onions. I found it quite amazing that local people in our area of western France were unaware of this tradition and couldn't understand why we thought of onions and bicycles as being typically French. It was another expat, who grew up in Wales and remembers the onion sellers knocking on the door, who explained it to our French friends. I must point out that she was not growing up in Wales in 1828 as this trade route continued for well over a hundred a years! Here is a traditional recipe for French Onion Soup. Cook the onions in the fat until lightly coloured. Add the flour, salt and pepper and stir over a low heat for two to three minutes. Add the stock, bring to the boil and then keep at simmering point for about thirty minutes. While this is cooking make the croutons. Grill a slice of baguette per person, rub with the garlic clove and place in the soup bowls. When the soup is ready, pour over the croutons, top with cheese and grill for a few minutes. A delicious and comforting lunch or light supper on a cold and damp day.